Stronger hair. A rich, gorgeous stain. That’s every henna head’s goal when taking an almost full day to henna her hair. I recently tried a new brand of henna called Yemeni. I had not done a henna treatment in over a month and my gray hairs were visibly showing. Yemeni henna is freshly imported from Yemen’s Sana’a Region. It is said to have rich, red dyeing properties. Of course on brunette hair, you’ll only get reddish highlights since henna does not lift the color of your natural hair. So, does Yemeni henna hold up to it’s claims? I mixed the Yemeni henna powder with a mixture of green tea (I didn’t measure it. I just kept pouring until it was the consistency of mud) and allowed it to sit over night for dye release. In the morning, I added a little more than a tablespoon of honey to smooth out the henna since this brand is said to be a bit grainy. After 4 hours of leaving the henna in my hair, I washed it out with Shea Moisture’s Coconut and Hibiscus Shampoo and sat under the dryer with Generic Matrix Biolage Balm for 30 minutes to balance the moisture. The shine is absolutely gorgeous and the stain is pretty good. I used my iPhone to take the photo above with the flash on so you can see it in High Def. I have to take an outdoor pic to get the color to show more. Of the various brands of henna I’ve used (I’ll share more in a future post), this one did something different to my hair. After rinsing, my hair felt noticeably stronger and about 15% thicker to the touch. 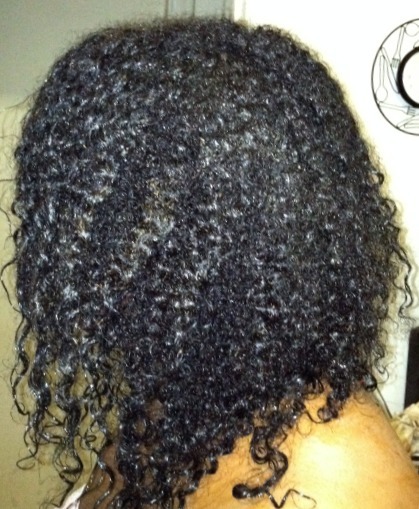 My curl pattern did not loosen one bit and the depth and thickness of my hair was amazing. After detangling and twisting, I noticed I had the most luscious twists achieved to date. Overall, I give Yemeni henna 4/5 stars. Why not 5? Because it was a bit too grainy for my taste. It took 2 washes and a good separating of my hair to rinse it out. I like my henna to rinse out with ease. In spite of the beautiful results, the graininess is a deal breaker for me. I am going to pass on purchasing this brand again. It will be some time before I purchase another brand though because I have 500 grams left! The process of preparing, applying and rinsing henna from the hair is tedious enough for me to have to put additional effort into it. I’m going back to Mehandi to purchase the Rajasthani Twilight henna. It contains the highest natural lawsone content of all the henna brands I’ve come across. 2.9% to be exact. The higher the lawsone content, the richer the stain. I also like that Mehandi shares testing results of their henna batches. I purchased Yemeni Henna from hennasooq. If you’re not concerned about the additional washing, you’ll get great results. Also, Henna Sooq is a little less expensive than Mehandi. So, it’s really up to you to weigh the pros and cons of each. I have never tried henna. I only have a few grays and I have read the rosemary oil over time can darken your hair. Do you know if this is true? If so I would be will to start using rosemary oil now to start masking my grays and future grays. Hi I don’t know about the Rosemary oil darkening the hair. Even if it did, I don’t think it has the staining power to cover gray hairs. What I do know about Rosemary oil is that its used to rub into the scalp to stimulate hair growth. Did I tell you that I tried the Mehandi and loved it? Thanks for putting me on to it, Michelle! Great! Which one did you get from them?